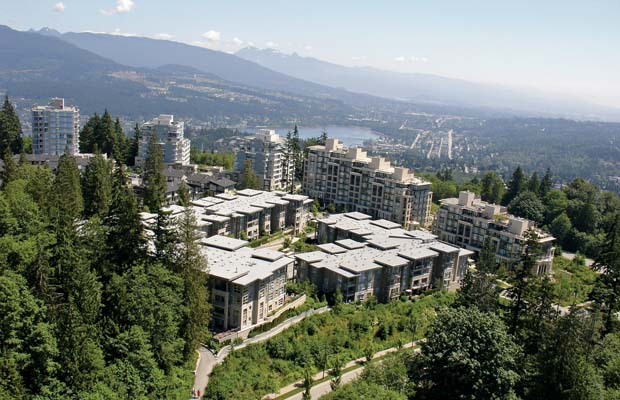 Burnaby city council on Monday approved a zoning bylaw for a massive expansion of the high-density urban community that will see up to 1,250 new units of housing built, including one 20-storey tower perched near the mountain’s peak with commanding views of Metro Vancouver. The first project will be a 74-unit low-rise wood-frame condo building by Porte Development, the second a 79-unit condo structure by Mosaic Homes. From the City of Burnaby’s perspective, in proceeding with such a large, single rezoning it gets to cross off a lot of the needs on its checklist of elements needed for the whole community. “First of all, we get all the infrastructure provided for to support all those parcels in one go,” Robert Renger, Burnaby’s senior current planner, said in an interview. In tribute to UniverCity’s aim of sustainability, the new buildings will also need to be at least 30 per cent more energy efficient than standard construction under specific requirements written into the zoning bylaw. Harris added that the first two buildings will be wood-frame construction with units aimed at first-time and family buyers. UniverCity has also broken ground for another element of the third phase, a 50-seat childcare centre designed to be a so-called “living building” that will generate more energy than it consumes over the course of a year. Phase 3 will include 12 building lots in total, ranging from four stories up to that one 20-storey tower, with all development required to adhere to more environmentally friendly energy standards. To date, the UniverCity development encompasses 1.4 million square feet of mixed-use space, including housing for some 3,000 people, retail development and institutional space. The community, which is being sold on a 99-year-lease basis to buyers, hit some milestones this year. Harris said a Nester’s Market grocery store opened in January to help anchor the community’s retail space, and University Heights elementary school, with an initial intake of 158 students, will start classes in September. He added that the Phase 3 plan has been three-and-a-half years in the making because they wanted the whole extension to fit under one comprehensive development zone.